Kids Castle Hire offers a range of products catering to children's parties. 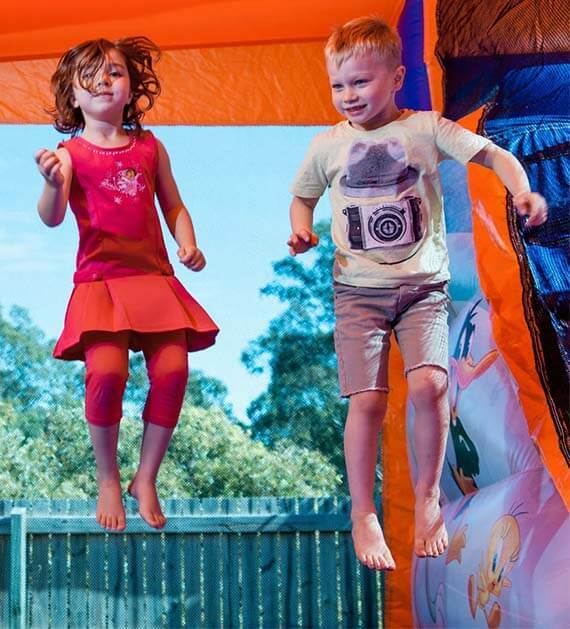 Children love nothing more than jumping around on an inflatable as it keeps them entertained and satisfied during parties and events. We offer a range of various inflatables for hire, as well as plastic chairs and tables for hire or purchase. All our inflatables are suitable for children aged 1 to 12 years, with some units being more suitable for particular age groups. We have listed photos of our products with guides as to pricing and age suitability. Please note that all prices are based on you collecting from us and then returning the same back to us. Full terms and conditions of hire, as listed below will be given to you when you collect the inflatable/s and/or chairs and tables. Full payment will be required with each booking. Should the equipment be returned damaged, you will be liable for the payment of whatever repairs are needed. Times for collection and return will be confirmed with you telephonically. You will be required to complete a hire contract and MUST produce positive identification, of which a copy will be taken for our records, in order to hire the unit/s.